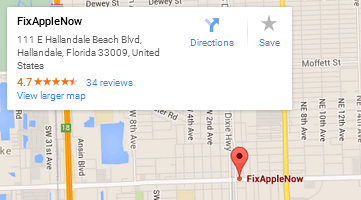 Below you can find driving directions from Google Maps to help you get from Aventura to your nearest Fix Apple Now store, situated in Hallandale. You can either copy the driving instructions below or click here for a larger map and driving directions. Do you have a broken Apple Mac in Aventura? Maybe you need to fix your iPad, iPhone 4, 5 or 6, your Mac Mini or iPad Mini? Whatever the case, if you've got a problem with an Apple device that you need to fix, we can help. At Fix Apple Now, we have the experience and expertise needed to solve your problem quickly and get your Apple Device to you in no time at all. Some of the most common problems we deal with include Bluetooth and cameras not working, iPhones and iMacs not charging, cracked or frozen screens, devices not turning on at all, music apps crashing and 'no SIM card' errors. We want to hear from you today if your Apple device has a problem and you need to find a solution quickly. We've helped Apple device owners from all across Aventura to fix, repair and restore devices like iMacs, iPhones and iPads, so why not get in touch today to find out more? We can deliver the service that you're looking for.